The Hybrid Racing 70mm K-series throttle bodies are by far the most feature packed throttle bodies on the market. 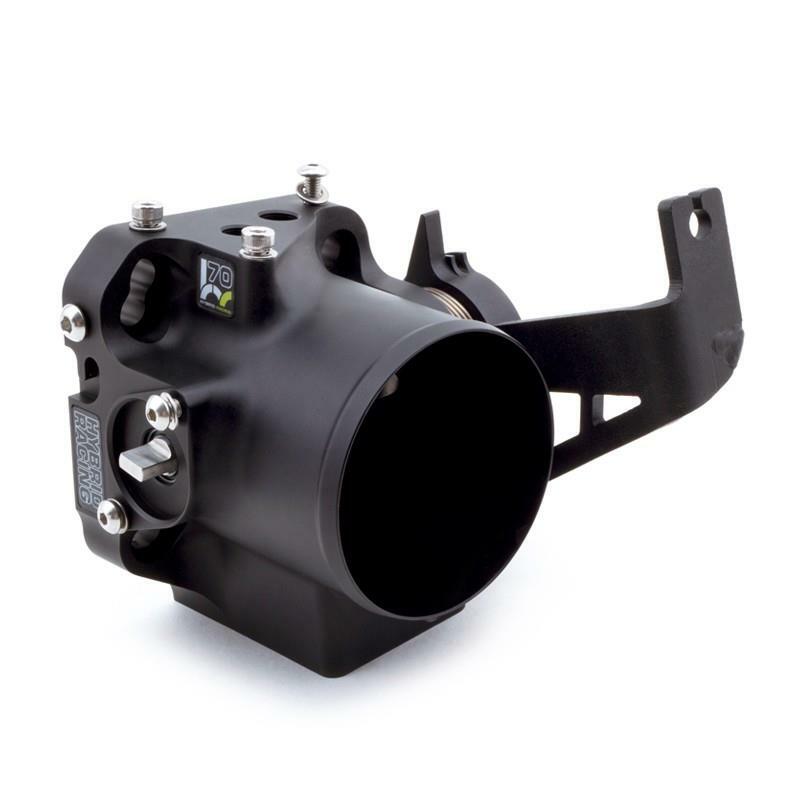 When we designed this throttle body, we wanted to create a reliable product that allowed as much flexibility in your setup as possible. One simple, but very notable feature of this throttle body is the dual bolt pattern. By incorporating two bolt patterns, this throttle body is able to bolt directly to a PRB or RBC intake manifold. By eliminating the need for an adapter when upgrading from a PRB to RBC intake manifold, this throttle body saves you as much as $75. In the spirit of making this throttle body the most setup-flexible on the market, we incorporated integral block-offs for the IACV, Emissions Solenoid, and MAP sensor. The IACV can be completely blocked off using the four included 1/8 NPT plugs. The Emissions Solenoid and MAP Sensor can be blocked off using the included aluminum plugs. Better yet, the aluminum plugs can be held down using the supplied retaining rings, meaning no worries of plugs popping out if you’re running boost! This throttle body also retains the IACV coolant port that many manufacturers hastily delete. This means that on K-swaps where radiator/IACV clearance is an issue, you can still rotate your IACV 180° and loop the coolant hose to eliminate the interference with the radiator while keeping the smooth idle offered by keeping the IACV. Also notable are the dual, concentric torsion springs. The throttle cable gets a dedicated torsion spring to keep the cable taut, just like in the OEM design. Two springs are used to shut the butterfly itself, making this throttle body the only NHRA legal big-bore throttle body on the market. Last, but not least, the three bolts used to fasten the brass butterfly to the stainless steel center shaft are staked. Staking is the process of deforming a bolt to prevent it from coming loose and falling out. This means that even if one of these bolts were to become loose, it would be unable to come completely out. If you’ve heard of people blowing up motors from bolts falling out of other manufacturer’s throttle bodies, then you know how important a feature this is. Our throttle bodies are available in 70mm bores with a 76mm inlet. The proprietary knife-edged 76mm inlet design means increased inlet velocities and lower inlet turbulence compared to competing throttle bodies. They feature dual ball bearings, dual needle bearings, integral O-ring seals, 6061-T6 aluminum construction, and a no-stick butterfly design. Each throttle body is supplied with stainless steel mounting hardware for all sensors and the throttle body itself. The kit also includes a custom fit thermal insulating gasket to help you keep intake temps down. It should be noted that a big bore throttle body should never be used on an intake manifold that has not had the inlet bored out to match the bore of the throttle body. A setup using a big bore throttle body mated to an OEM sized inlet port will yield lower performance than the OEM throttle body. That said, when boring the inlet on an intake manifold, it’s best to overbore slightly (about .25-.5mm is sufficient), to prevent the chance of a lip that could create turbulence.